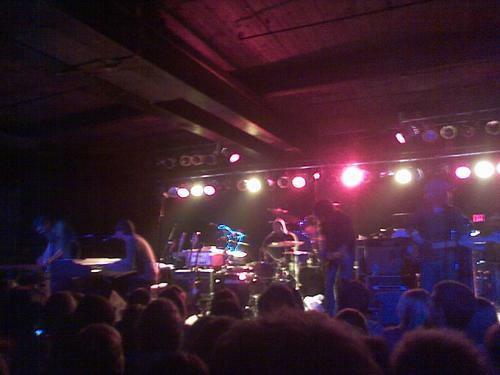 Copeland came to Atlanta on Tour with The Rentals, and it was pretty clear that most of the audience was there for Copeland. This was yet another band I’d waited far too long to see, and I was excited I finally got the chance to. The Masquerade is a small club, with a fairly standard sound and lighting set up. There’s no flashy gimmicks here, but this is arguably the most intimate venue in Atlanta. I’ve seen some of my favorite performances at this place. While this is a great place to see a show, it's a horrible place to take pictures. My "Photo Access" got me into the venue, but not much else, since there was nowhere to get up close and take pictures. Not to mention the lighting here is incredibly sub par, I struggled to get anything resembling a real shot. So anyway, a band called Golden Boy opened up the show. The crowd was mildly receptive; about as much as you could expect a crowd to be for an unkown band. Golden Boy put on a very solid show however. Their sound was especially large for a trio, at times almost enveloping. I was impressed. Next, we had Copeland. Why these guys weren’t headlining, I have no clue. Maybe they’re just being done a favor by The Rentals, or maybe they’re just all friends hanging out on tour together, but the crowd was there for Copeland and they should have played twice as long as they did. 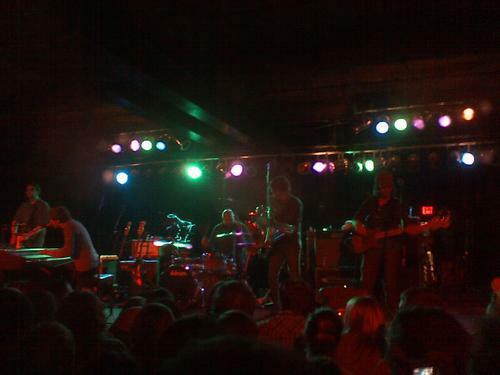 Copeland played for maybe 35 minutes, and covered songs from all three of their albums. The songs off of their first album Beneath Medicine Tree were obvious crowd favorites (mine as well) and were absolutely beautiful. They played “Brightest,” and “Testing The Strong Ones.” I really wish they had done more off of this album, as I feel it captures best what this band is great at. Also played (and I’m sure some songs are lacking) were “Sleep,” “Love Is A Fast Song,” “You Have My Attention,” “Pin Your Wings,” and “Eat Sleep Repeat.” I might have those slightly mixed up, but that pretty much covers it. Copeland has a new bassist on this tour, and he did great. Aaron’s vocals sounded terrific, and the rest of the band filled in nicely. Copeland is one of those bands where the crowd sings every word to every single song, and it creates this background choir that creates an atmosphere like no other. “Brightest” sounded unbelievable, I have to say. I’d waited a long, long time to hear that song live. Also, at the end of the set, most of the audience was begging to hear “California.” Sadly, the cries went unheard and Copeland finished their set without this stellar track. So until Copeland comes back to Georgia, I won’t be hearing “California” anytime soon. All in all, a very good show, unfortunately too short sincethey weren’t headlining. Hopefully next time lives up to my full expectations. Now we have been lucky enough to crack the peaceful nod to a particular tasting with all the brew on Monday night. It is sad that someone so out of touch with American thinks that he is in touch AND is so able to convince Nebraskans that he is a leader. There is a huge difference between holding a position of authority and that of being a leader. In Governor Heineman’s case, he holds a position of authority… that’s it.